Make Your Small Business Saturday Celebration Special! CASE STUDY: A small town in Maryland encouraged people to visit multiple businesses on Small Business Saturday with a community-wide Scavenger Hunt! What THEY did: The organization came up with a list of clues for Small Business Saturday. To complete each clue, shoppers were required to visit participating local businesses and search for answers. The Result: The event fired up the entire community and inspired customers to visit, experience and #shopsmall at multiple local businesses! Create a "How To" sheet and distribute it to businesses you'd like to get involved. This sheet should give a brief description of a Scavenger Hunt and how they can help the event come together! Use the power of print! Once you know how many businesses are participating, visit your local printer and print a poster for each business to hang up in their window. It's a great way to raise awareness within your local community about the event. Print table tent cards on thick stock and place them next to the registers of every participating business to remind shoppers about the Scavenger Hunt. Create a map (like the one below) and deliver them to participating businesses. Fire up your local neighborhood by promoting the event throughout your community and on social media! PRE-EVENT: #SmallBizSat is Nov 28. The businesses in [NEIGHBORHOOD NAME] will be hosting a Scavenger Hunt for the day. Visit [PICK UP LOCATION(S)] to grab your clues and join the fun! Thank you for supporting small businesses along the way! Get out and #ShopSmall. DAY-OF-EVENT: Today is #SmallBizSat! Don't forget to pick up your clues for the Scavenger Hunt in [NEIGHBORDHOOD NAME]! 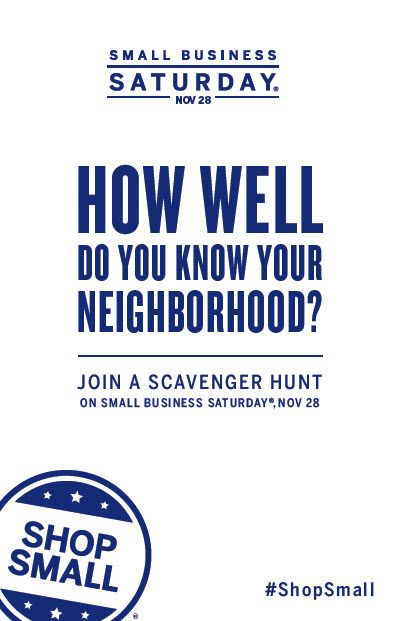 POST-EVENT: We hope you had a blast during the [NEIGHBORHOOD NAME] Scavenger Hunt for #SmallBizSat! Thanks for supporting our businesses! Work with participating businesses to brainstorm how maps will be collected at the end of the day. Feeling inspired? Great! Tweet @TheKnotPro or tag us on Instagram using #TheKnotRocksSmallBiz telling us how you're celebrating #SmallBizSat and we'll share your stories!